From the outside, the Geology Museum Ipoh (or Geological Museum or Muzium Geologi) looks rather drab and dated so I was not expecting to find much inside. Perhaps a few boring rock fragments in dusty display cases. 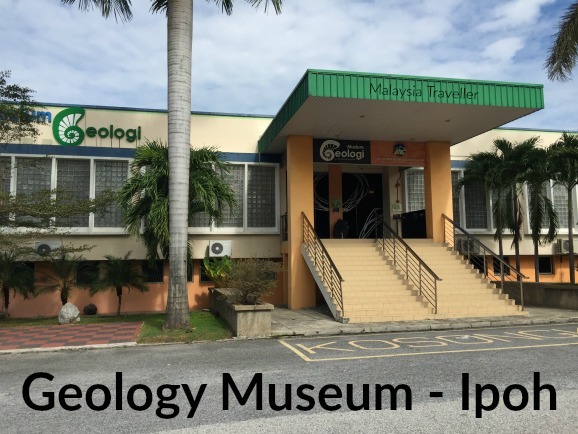 But I was pleasantly surprised to find a modern style museum, well presented with lots of interesting displays providing in-depth information on various aspects of geology in Malaysia. 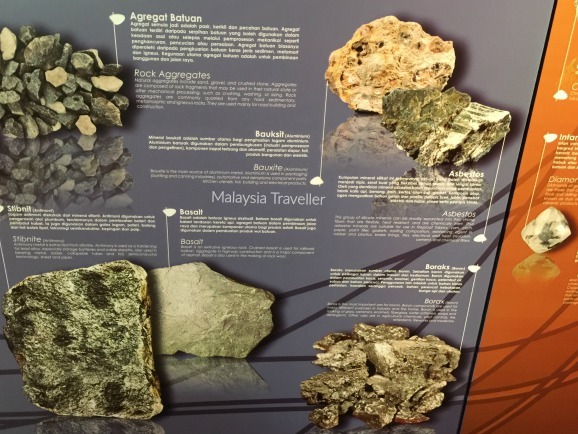 The museum forms part of Jabatan Mineral dan Geosains Malaysia (Department of Minerals and Geoscience). The museum was set up in 1957 but has since undergone a thorough updating internally. This section gives background on the history of the museum and the early days of the Geological Survey Department. 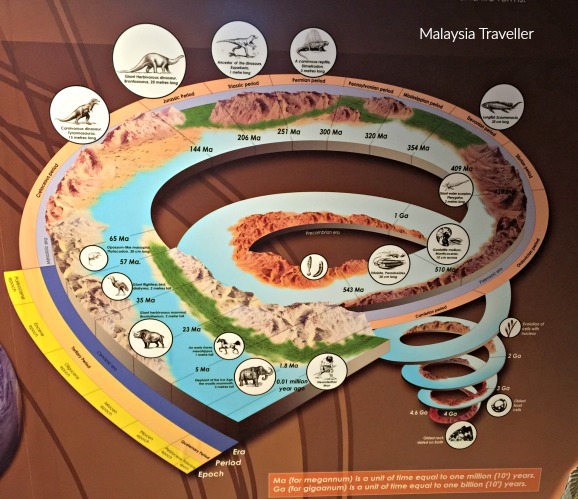 A wall chart shows how the earth evolved over billions of years, up through the dinosaur periods up until the present era. This section covers dinosaurs, fossils and rocks. If you have any young ones with you the moving animatronic T-Rex model should give them a fright. 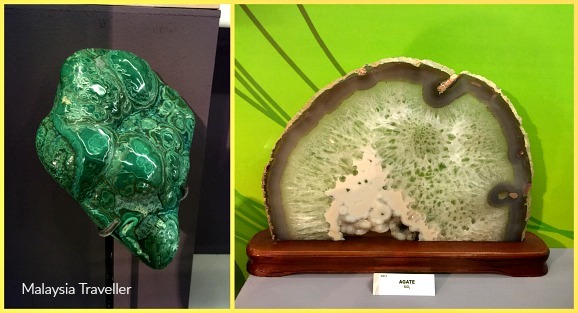 Here you can admire some lovely specimens of gemstones, crystals and minerals such as these malachite and agate examples. Amethysts, quartz, beryl, fluorite, desert rose gypsum, garnet, pyrite, calcite, chalcanthite and stibnite are among other minerals on display. This zone shows the ways we use minerals to enhance life, with explanations on diamonds, rock aggregates, bauxite, basalt, asbestos and borax among others. 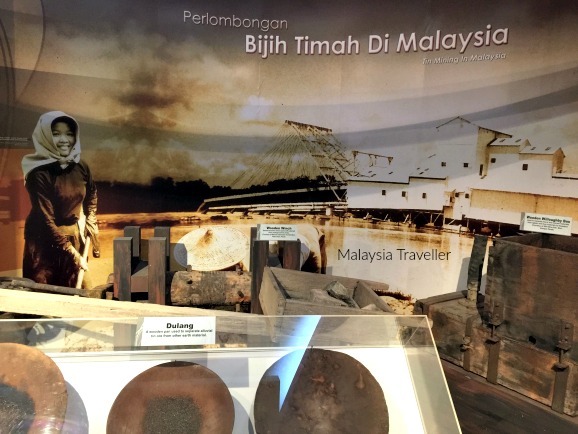 It seems no museum in Malaysia is complete without a display on tin mining and here you can see examples of mining equipment from the past as well as a display on coal mining in Sarawak and Sabah. This section explores how mineral exploration and geological surveys are carried out. 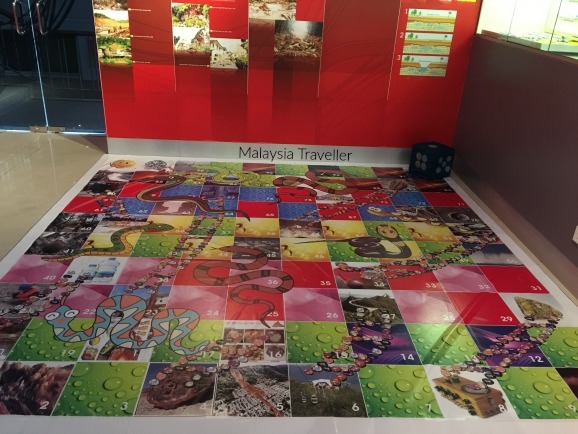 In case the kids are getting bored there is a giant-sized geology-themed snakes and ladders board here. 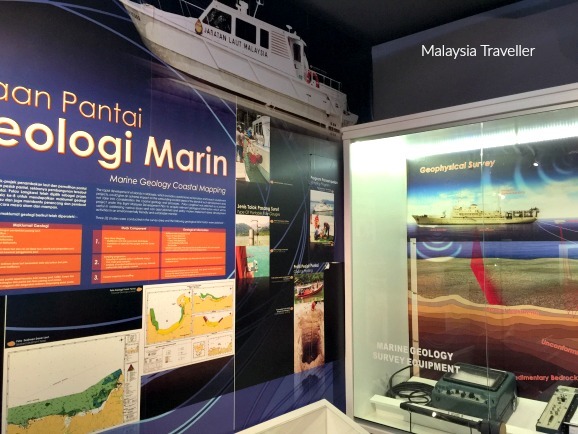 This section includes information on geoheritage activities in Malaysia and outstanding geographical features such as the granite twin peaks on Tioman Island, stalactite curtain wall at Gua Tempurung, Perak and the spectacular Klang Gates Quartz Ridge. 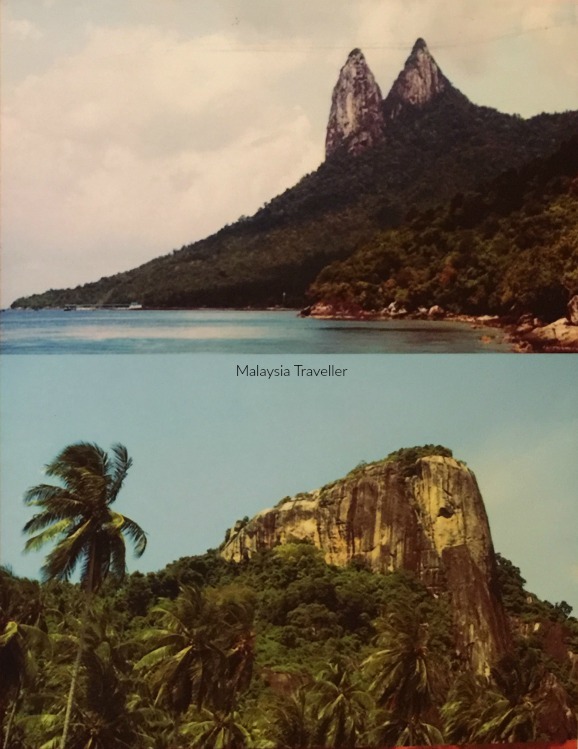 Top: Twin peaks on Tioman Island. Below: Elephant head rock at Bukit Buau, Pemanggil Island, Johore. 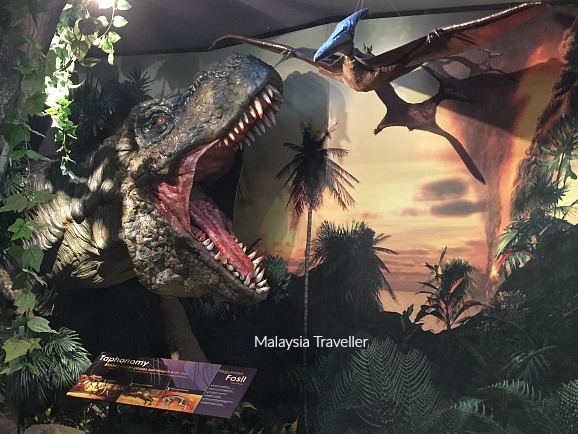 One of Malaysia’s better museums with more in-depth coverage of the topic. Would be of particular interest to anyone studying geology or geography but well worth a visit for the casual visitor.